"A really fat, driving, varied, epic Melodic Death album. This just makes mood, the neck muscles burn, as it must be." "Overall, the record shows exactly what I think of as Melodic Death Metal - a balanced sound, straight riffs that are carried by the rhythms of the guitar and bass, and a groove for rocking and fist-swinging ... people, if you do not have the record yet, then quickly get to these pearl!" "There are these albums that you think you've heard before, and then there are those discs that totally surprise and knock you out - and then there are albums that do both. One of these acoustic jewels is the current disc of the Lower Rhine man of BATTLESWORD." "… guitars of powerful timbres … melodic solos enrich the compositions … powerful, guttural vocals … interpreted with impetus … the tracklist is so intense and balanced, that it is difficult to highlight one or another composition, because each time a different track appears that calls attention. It is important to emphasize the quality of production, which sounds current, but without falling into the pitfalls of unnecessary modernizers. Great record." "… intertwines the distinct traits of the traditional sound of Heavy Metal with their signature Melodic Death sound, all held together by a growling vocal delivery … brutal barrage of riffs … high velocity, rampaging and raucous … giving me the opportunity to see just how far my neck muscles stretch as I violently bang my head, all the while stomping around, making my own wall of death … raw power …"
"The songwriting is quite variable with the addition of classic Heavy Metal riffs and keeps the suspense consistently high. Of course, the wrecking ball was also held high on this 11-tracker, the driving drums are heavily used again and the melodies got incorporated to perfection in the tracks. The result is simply an effective mix of several Metal styles that are perfectly interwoven." "… a really first-class album." "Strong guitars lead into a Metal album that neither breaks out nor tries itself out ... a good longplayer that does not do anything wrong." "Strong return of the Melo-Deathers from the Lower Rhine ... presents itself on the new record in an extremely powerful sound-robe, whereby the production not infrequently reminds of the last discs of the Swedish Vikings Amon Amarth and thus fits perfectly to the song material ... the guys have their own sound found within the boundaries of the genre, which is particularly pleasantly different from the many more modern-oriented newcomers in the scene." "The music is a gem for friends of the melodic Death Metal, which is worth listening to and listening into, as well as buying, of course." "It is hard to imagine that an album of this calibre has been released independently, while many labels seem content enough to follow the flavours of the day with frightening precision … 'Banners Of Destruction' is most definitely a highlight in the Melodic Death Metal genre that many established acts will have to measure themselves against this year!" "This attacking album shines with consistently strong guitar fractions, whipping rhythms and uncompromising forward thrust, but also leaves a bit of room for relaxed moments." "Heavy Metal has a lot of importance in many compositions … he is dominant in 'Banners Of Destruction' … with good solos … good double bass drum sessions and cavernous voice … the technical level is good … the voice is good … their Melodic Death is well played." "Singer Axel, bassist Ben, drummer Andreas and the two guitarists Björn and Jürgen do not give a damn ... all Amon Amarth fans are allowed to access, who get their money fully worth." "… is the increase in quality ... impressive and testifies to a lot of diligence and perseverance. An album like "Banners Of Destruction" is not just written between the taps ... really pays off to take a closer look." "The five-piece in the classic line-up with two guitars delivers official boards over all twelve songs, to which one responds aptly from headbanging to low knees." "… a high technical level, paired with subtle melodies, the necessary speed, a suitable sound and a convincing singer ... a thoroughly convincing Melodic Death Metal album that sounds fresh, fast and charming." "No matter whether you consider yourself a pure Old School, or Death Metal fan, the melody as expressed in the riffs and drumbeat will likely ease you up and put you in a mood where you just want to go with the aforementioned flow." "BATTLESWORD plays a style of Melodic Death Metal that is more rooted in the 90's Swedish style … the production sounds very professional for being a self released recording … very great sounding …"
"… does not have to fear any comparison, here everything is correct: frontman Axel grunts first-league-ripened through the botany, the guitar work is excellent variable and punchy, and the rhythm section gives the songs a brisk and solid backbone." "… excellent work … certainly deserves the attention of the epic troops of new defenders ready to battle with Epic and War Power / Death Metal … a successful mix between Amon Amarth's Melodic Death Metal and Power / Heavy metal of historical groups of the classical scene … a welcome surprise, keeping the listeners glued to the headphones from the first to the last note without getting tired and deserving the proper attention of those who love these sounds." "… the mix of rather midtempo songs (the gas pedal is thankfully not constantly down to the stop) and melodic guitar work undeniably can do something. Thanks to a crisp production, BATTLESWORD are becoming a real alternative in this sector and, as a German band, are urgently worthy of support." "The first thing that strikes me is the fat sound ... gentlemen, that sounds pretty cool! The opener 'Spirit Of The Flesh' comes with a pounding beat and reminds us one by one of Bolt Thrower and Celtic Frost ... good Melodic Death featuring classic Metal elements ... some of the guitar solos on this album have Judas Priest unmistakably recognizable with their chorus-effect laden sound and in the manner of playing." "… one of those robust and punchy albums that - until a new Amon Amarth album comes out - gives you plenty of interesting." 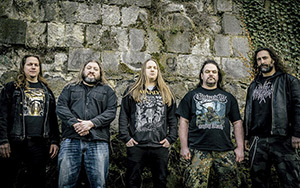 "… a pleasantly audible melodic Black Metal disc … guitar riffs are powerful and "to the point", the solos sound melodic … powerful raw vocals that remind us of Amon Amarth …"
"BATTLESWORD could be one of the next greats in Melodic Death lead …"
"If you had to decide on just one silver-plate today, the chances for 'Banners Of Destruction' would be surprisingly good ... since all early stages of today's genre-laces Amon Amarth, Arch Enemy and Paradise Lost are lovingly honored." "Big diversity and very varied ... the thing must hit, because songwriting, emotion, mood, there fits everything for me ... awesome album that does not fall off to the rear - more of it please!" "The disc pops in totally. Apart from a few quiet or slowed down moments, the twelve tracks ... really go forward. Aggression, wildness, riffing thunderstorms, grooves, growls and pathos provide for the immensely explosive effect of the presented. The self-produced, mega-enormous sound fits like a 'fist to eye' to the high-class and demanding material ... the best entertainment for extreme Metal followers with an unmistakable flair for melodies." "… sophisticated songwriting ... the line from Amon Amarth to In Flames has left more than clear marks." "… everything that one may expect as a Melodic Death metalhead ... rough riffs, plenty of double-bass, sophisticated melodic bows and, of course, crude growling ... a thoroughly successful Melodic Death album, especially considering that this is an in-house production, what you don't hear on the disc at any second." 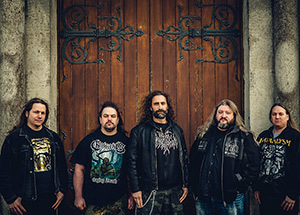 "An extremely crisp produced disc … 'Banners Of Destruction' (self-publication) can score with a dashing-fat guitar sound, punchy drums and a lot of transparency - ideally tailored to the powerful Melodic Death Metal of the German quintet, which reminds one and the other of Amon Amarth …"
"'Banners Of Destruction' is an album which simply grows in impressiveness and dexterity over time, each listen revealing fresh layers and dynamics maybe veiled upon initial visits. The same can be said for our ears about the tones of vocalist Axel Müller, his ursine delivery raw and centered on one attack to unsettle and scar ears yet with each listen his presence persuades that the album would not be as potent without his organic growl or indeed the specific craft of his companions." "Blending the epic Heavy Metal of the 80's with the Death and Viking Metal of today, BATTLESWORD come up with a refreshing new take on the genre. Vocals are extreme and barbaric, while the guitars can soar melodically or bring affairs down to a crushing arsenal of badass riffs … a work, worthy for any good Metalhead, whether you're into Viking, Death, or traditional Heavy Metal." 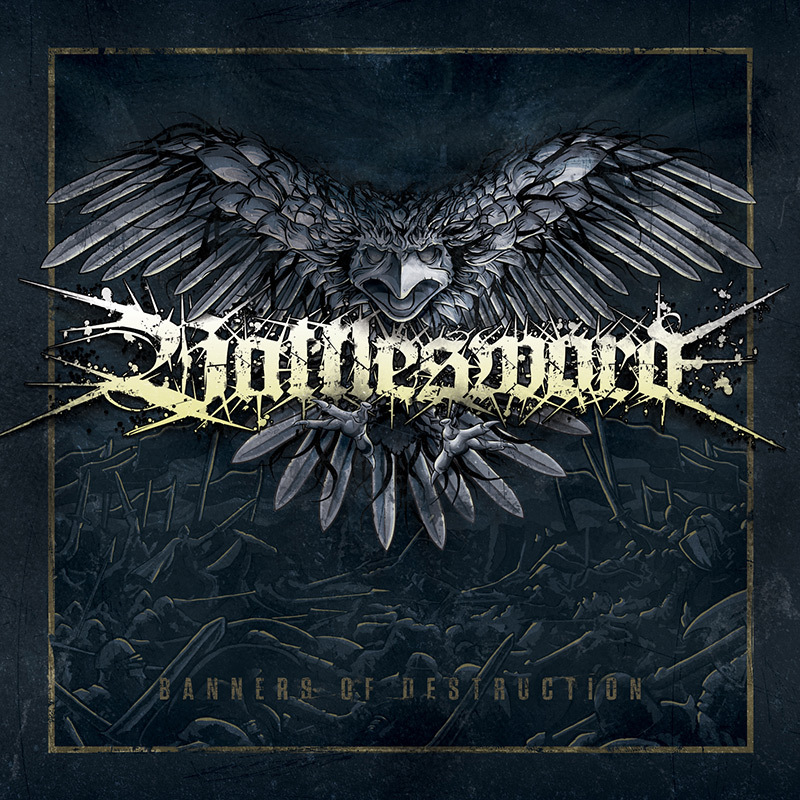 "… BATTLESWORD have released an album that should cause a stir in the underground. Clear, hard song structures that you simply can not escape. Speed ​​and toughness go together very well and the band is also very strong in songwriting." "… uniqueness and originality is brought full circle … solid mix of groundbreaking works, that become satisfying. Vocal chords being fierce, while the instrumental portions performed by the guitars, bass, and drums, provide an intense hook, keeping you entertained and highly interested … the works upon "Banners Of Destruction", is heavy, melodic, and fun to hear, throughout its entirety." "… a very strong and dominant sound … hellish beauty, 'Banners Of Destruction' leaves pleasure rife … grabs the imagination from start to finish and nurtures a real anticipation for its successor." "… very classical within the genre, and the refined technique that they have on the use of the tempo of each theme and the rhythms is great." "… a great surprise as a mature and competent band in the genre they chose to play … made it easy to be reviewed because they are a hot band … full of emotion. Not warm and overproduced. Guitars are free to fly … about musical honesty, BATTLESWORD turn out to be a good example … twelve tracks are true gems of Metal … just the crude and cruel reality of mankind's condition translated into guitar riffs, drum beats, pounding bass and raw vocals … a big hail …"
"BATTLESWORD have delivered a hard hitting and pulsating album … a brutal and savage journey … earth shattering and head battering Death Metal with infusions of Thrash to add to its heaviness." "… indelible sample of MeloDeath, a style I simply adore because of its contrast between the dark vocals and the melody of guitars … BATTLESWORD is a very mature and technical band, which already set a mark with 'Banners Of Destruction'." "… absolutely fantastic creations that you get in all 12 tracks of this album." Since 1999, BATTLESWORD on the Lower Rhine have kept the heavy flag of MELODIC DEATH METAL resolutely high in the storm of stylistic trends and musical fashions. With a mighty live performance and unspeakably powerful songs, the capable five-piece regularly provides extensive neck pain and happy moods among the fans. In the camp of the authentic, because completely sincere troupe clearly is preferred class instead of mass. Since the existence of the band, therefore, only two demos and two albums have been released. For the preparation of their second long player, BATTLESWORD have taken the necessary time even longer than usual. But in 2015, the recordings and the mix for the long-awaited album "Banners Of Destruction" were successfully completed. Official release date for "Banners Of Destruction" was April 1st, 2016. "Banners Of Destruction" pops with a true bomb sound that rages as voluminously forward as it can shine with transparency. The tastefully oriented songs, despite the rich and cutting hardness, show BATTLESWORD again in their old strength and the record convinces persistently old and new fans alike. During the songwriting this time care was taken to keep the music a bit more variable than at the beginning. In addition, the compositions were expediently extended by some classic Heavy Metal elements. The result is an original composed, homogeneously rounded and therefore perfectly functioning mix of everything that sets the charm of this metallic kind of loud art. Consistently outstanding live qualities were massive proven by the highly ambitious formation at various festivals, such as 2017 at the Metaldays Open Air in Slovenia, or the German indoor festival Battle of Otzenhausen. And also at concerts, f.e. as support for more well-known bands such as Moonsorrow, Thyrfing, Suidakra, Warpath or Debauchery, the five convinced ones let it crash powerfully. The year 2018 will continue to be characterized by ambitious creativity for BATTLESWORD. In addition to new live appearances at the Metaldays Open Air or the Metal Inferno in Paderborn, Germany, as support for Grave and Holy Moses, the five musicians are already in the middle of songwriting for a new album!